Senn High School Receives Grants & Hosts Art Festival Reviewed by Edgeville Buzz on May 2, 2009 . U.S. representative Jan Schakowsky has announced that $381,000 in federal grant funds is coming to Senn High School for new state-of-the-art science labs. Also, a four-year grant for $400,000 from AT&T and DePaul University has been awarded to Senn’s AVID college-prep program. The money will go towards professional development, strengthening parental involvement, tutoring/college readiness seminars, trips to colleges, and universities, and direct connections with the university experience. 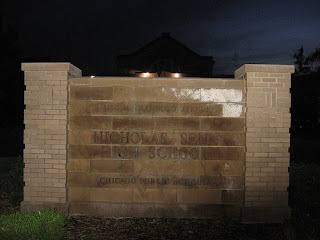 Senn High School, 5900 N Glenwood, will be prepsenting an Art Festival on Saturday, May 16, 9 AM to 12 Noon at their Front Campus. The Festival will feature piano solos, poety recitals, clay art building demonstrations, student artwork, face painting and henna tattoos. Bring the family and enjoy getting to know our local high school students.